Plenty of flying today, the solstice, with warm sunshine and light winds. Lloyd (see previous post) did a second solo, and there were student flights, instructor checks and members just having fun. For details of the Bronze briefings starting on Saturday 5 January see www.facebook.com/bookerglidingclub or the noticeboard in the clubhouse. Much milder today, positively warm in the sunshine, though the mud had thawed, so some areas of the field were best avoided. With light winds the air was smooth and the scattered low cloud provided some picturesque views. The K13, Junior and K18 were busy until mid afternoon until misted canopies put an end to play. Congratulations to Lloyd Batting who started his training 3 weeks ago and today did his first solo. He does have some experience from flying radio controlled scale models, but it's a bit different when you're inside looking out. Also flying today was Paul, making use of the IntroPlus course he was given as a gift. 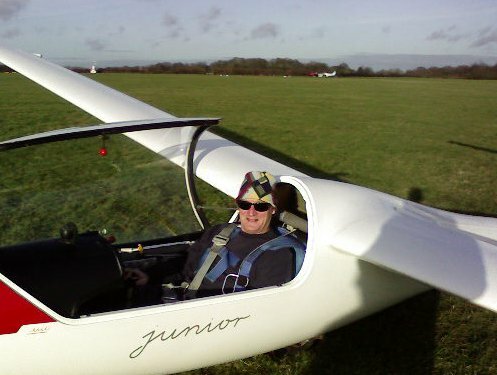 After two launches to 4000ft, during which he progressed to spinning﻿, he was completely sold on how fantastic gliding is and went away with the leaflet about the Winter Basic Course. ﻿ It was a very picturesque day and ideal for training as the air was, according to Geoff the tug pilot, 'smooth as silk'. 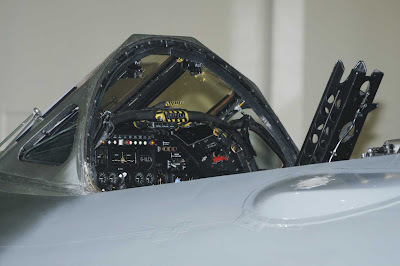 Follow us on Facebook www.facebook.com/bookerglidingclub. Now where did they get that idea from? 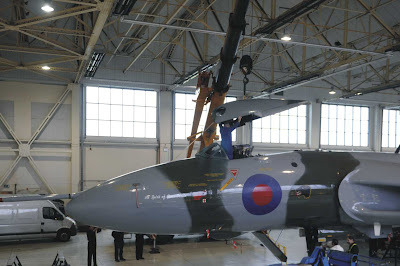 Don't forget to donate to the fund if we are to see XH558 flying in 2013! Another sunny frosty day - the hangar doors were frozen shut - but it was warm enough in the sun, and the air was calm, ideal for training flights. The Falke was put to use doing circuit practice, until a bit of a flat tyre stopped play. Meanwhile there was instructor training on the go - lots of cable break practice - and local man Gary came along to see what his town looked like from above, he was delighted with the experience and went away clutching leaflets about some of our courses, plus information about corporate team building days and group flying. In other news, Booker's cabriolet K13 is front page news on the latest Sailplane and Gliding. It was a cold and frosty start to the day, with mist in the valleys, but the participants in Graham and Alun's aerobatic course were well wrapped up and were soon out practising their loops and chandelles and other impossible figures. One of the course members had joined the club especially in order to take advantage of the aerobatic courses we run. There was some rather more sedate flying going on, including Chris taking his second flight in the Junior. Flying went on until late, with only the occasional tea break when the cloudbase came down below 2000ft. Aerobatics courses run throughout the winter on the first Saturday of the month, they are very popular so book early to avoid disappointment.